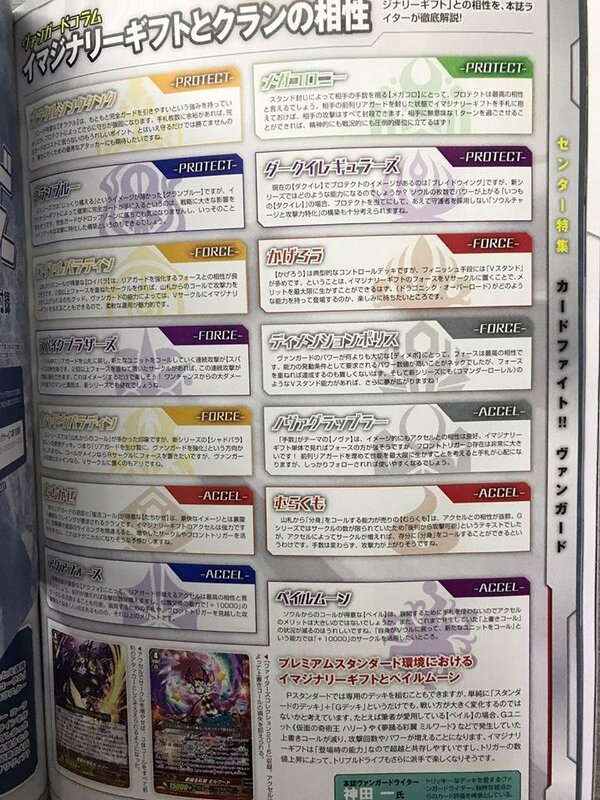 A page from Card Gamer magazine gives insight into how 14 of Standard Vanguard's 24 clans will interact with the Imaginary Gift mechanic. The image is rough, but an approximate summary of each clan's role is given below. Force - When your grade 3 unit with the Force ability is placed on the vanguard circle you add a Force marker to any of your circles, and for the rest of the game anything moved into that circle gets +10000 power during your turn. These decks emphasize "balance." Accel - When your grade 3 unit with the Protect ability is placed on the vanguard circle, you add an Accel marker to the left of your leftmost front rearguard circle. That marker becomes a new rearguard circle, and anything you call to it gets +10000 power during your turn, but it cannot be boosted. The next time you ride a grade 3, you add another Accel marker to the right of your rightmost circle, then you return to the left for the instance after that, and alternate endlessly. These decks emphasize "attack." Protect - When your grade 3 unit with the Protect ability is placed on the vanguard circle, you add a Protect marker to your hand. The Protect marker acts as a perfect guard while in hand; you can guard with it to discard a card to negate attacks. It has no grade nor other unit information, and cannot exist outside the hand or guardian circle, so after use it returns to the Gift zone. These decks emphasize "defense." The Gift Marker in hand counts for the purposes of Oracle, increasing your hand size to make meeting the conditions easier. Because the clan draws so many cards, it can pay the cost of using Protect Markers as perfect guards again and again, nullifying countless attacks. Just defending won't win you the game though, so OraThin will have a powerful attacker to close games with. For the clan that focuses on resurrecting cards out of the drop zone, the discard aspect of Protect meshes well with its play style. First you discard units to block attacks, then pull those same units out next turn to use offensively. Force synergizes with Royal Paladin's overall strategy of calling rearguards from the deck, as those rearguards then have a basic power bonus to work with even if they're not boosted. Doubling up on the number of Force markers on one circle is recommended, making rearguards that are as threatening as the vanguard. Spike Brothers also call from the deck, but emphasize repeated calling mid-battle phase. You can set up 2+ Force markers on a rearguard circle, then structure your attacks so that this circle repeatedly empties after battle and gets a new unit called into it that will then gain the 20k power boost. This clan calls from the deck in order to later sacrifice its rearguards to power up the vanguard. In the new series, this can be used to either strengthen the rearguards for their attacks before you sacrifice them, or to focus on making the vanguard overwhelming. This is a highly technical clan that superior calls units by retiring them, which Accel enhances by giving you additional rearguards to get your timing right with. This clan is also one of the few to have access Front Triggers. 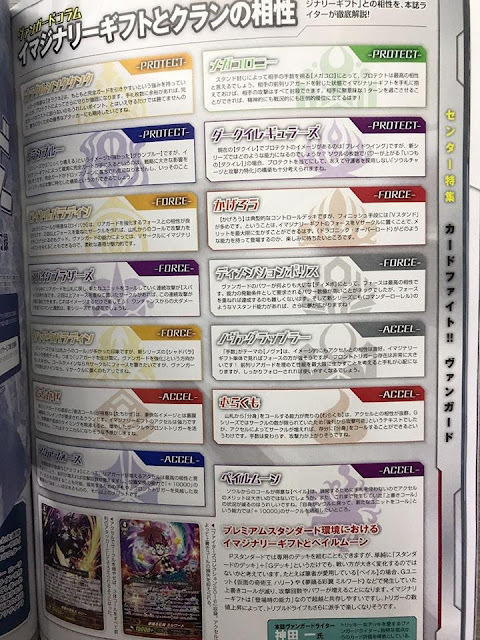 Aqua Force emphasizes making additional attacks and resolving skills based on the number of attacks made, so Accel is a natural fit for the clan because it increases both the number of times you can attack and the ways in which you can structure those attacks. The additional power makes those attacks matter more. (As opposed to Tidal Assault swinging for 16000 --> 4000 at 13k bases in BT09 format.) Aqua Force will also have Front Triggers in the new format. This clan focuses on preventing the opponent's units from standing, controlling their board by reducing their number of attacks each turn, and reducing their hand size by forcing them to call over paralyzed units. Protect keeps the opponent on total lockdown, as whatever attack they can make is negated. The old image of DI as a Protect clan would be "Blade Wing," but what kind of ability could that become in the new series? The old DI was themed around increasing power by increasing the soul, and with Protect they can become a "soulcharge to increase power" deck that does not run Sentinels. Protect eliminates the risk of never seeing a perfect guard due to soulcharging it. Kagerou is a control deck which in the endgame finishes the opponent off by standing their own vanguard. Placing Force on the vanguard circle plays to that winning image. You should look forward to what Dragonic Overlord's skillset will be. DP revolves around powering up the vanguard to achieve its goals, so Force is the gift that best supports their strategy. You can look forward to a Commander Laurel-type vanguard stand ability in the future. This clan's theme is attacking multiple times with powerful rearguards, so Accel is an obvious match. The issue promises that Front Triggers are going to be a big deal for Nova Grappler. Murakumo's strategy is to call "shadow clones" of units already on the field from the deck, then send them to the bottom of the deck in the end phase, preserving them for next turn with hit-and-run tactics. However, up through the end of the G series there was a further emphasis on attacking from the back row. Due to the nature of Accel creating additional frontrow circles, this is no longer possible. On the other hand, it was also possible to run out of circles to call to, unless the Murakumo fighter deliberately held back. Accel fixes this flaw by ensuring there's always a new empty circle every time you ride a grade 3. Thus, you can attack many times without depleting your hand. Since Pale Moon attacks multiple times by pulling cards in and out of the soul during battle, Accel's power boost and additional circle is a good fit for the clan's technical play style. You can also use the additional circle to play around situations where you would originally have retired units that you would call over. Additionally, the article recommends taking advantage of Pale Moon's unique characteristics in Premium Standard format, where fighters will have access to the G Zone as well as Gifts. It makes special mention of Masquerade Master Harri and Dreamiy Axel Milward. Harri can call up to three units from soul on-attack, making use of the additional frontrow rearguard circles, and Milward calls two units out of the soul in the main phase, which can likewise make use of that fourth/fifth circle. The power buffs from these cards also help compensate for the lack of boost on Accel circles. The Gift mechanic will first be commercially available in Trial Deck 01: Sendou Aichi and Trial Deck 02: Kai Toshiki, launching in Japanese May 11th, 2018, and in English June 8th, 2018. They will be accompanied by a new sleeve based on the Imaginary Gift design. The first Booster Set of the Standard format, BT01: UNITE! TEAM Q4! will launch in Japan May 25th, 2018, and in English June 22nd, 2018. The accompanying new anime series, codenamed "Origin," will begin airing May 5th, 2018, on TV Tokyo and affiliated stations. It will be simulcast with English subtitles on YouTube and Crunchyroll.